Editor’s Note: This is part 1 of a 3-part series. They Dodgers have won five division titles in a row, with win totals of 92, 94, 92, 91, and most recently 104. Currently at 85-68 they’ll have finish the season 5-4 in order to have their sixth-straight 90-win season. The 1951-56 Brooklyn Dodgers won 90+ six years in a row, so this six-year stretch would give them the most successful stretch since the team moved to California. They’ll likely also have to do at least that in order to win their division. A very similar Dodger team last year won 104 games with a dreadful stretch in August and September where they went 5-20. At one point, they were at 89-35 (.718), a pace that would break the single-season win record of 116. A year later, they’re struggling to make the playoffs. 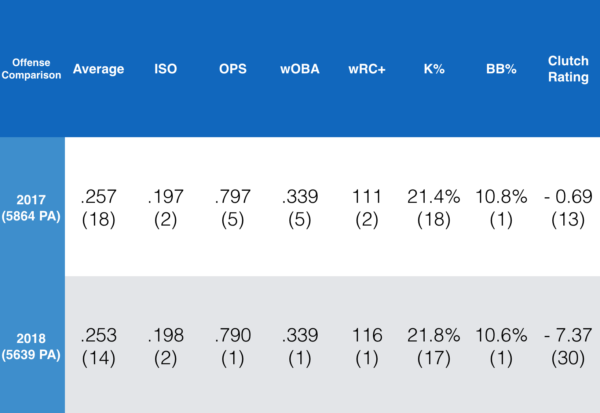 The season definitely started poorly, losing Corey Seager a month into the year, while Justin Turner missed nearly the first two months entirely. 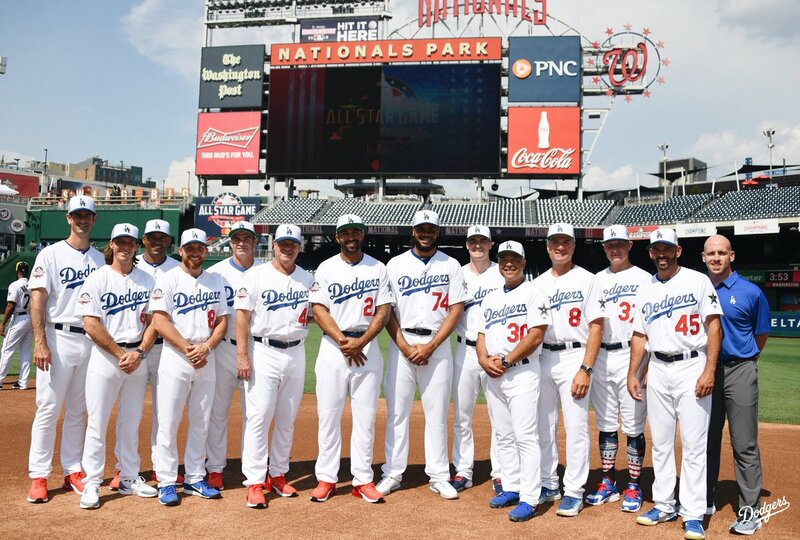 At the same time, they still had three All-Stars this year, and added a fourth in Manny Machado at the deadline. Still, they’ll likely end the season somewhere between 14 and 10 wins short of last years total. So what gives? They’re sixth in runs scored per game (4.8), and the five teams in front of them are almost all postseason locks — Oakland, Houston, Cleveland, New York and Boston. Yes, this means they lead the NL in runs per game. They excel in preventing runs, with only 3.8 allowed per game, trailing only Houston. Both of these factors explain why they lead the NL in run differential by more than 40. Still, with only nine games to go, their lead over the Rockies is just 2 1/2 games. It’s looking more and more promising that they will in fact make the playoffs, but it’s staggering that they ended up in this position in the first place. Currently, the Dodgers have the fifth-best record in baseball over their last 20 games at 13-7, trailing only Milwaukee (14-6) in the NL. Over their last 30 they’re 19-11, tied with the Brewers for the third-best record overall and the best in the NL. If we look at those seven losses in their last 20, there’s reason to believe the team is playing even better than indicated. Most recently, they were shutout by 37-year-old Adam Wainwright who hasn’t been good since 2014 — no excuses there. In the Reds series, their first loss was bad as they just couldn’t overcome the seven runs given up by Alex Wood. Besides that, they lost against the Reds best pitcher in Luis Castillo, who admittedly has very good stuff and pitches well at home (3.51 ERA). In the prior Colorado series, they lost to Cy Young candidate Kyle Freeland at Coors Field after dropping two of three to the Mets. One was against the inevitable NL Cy Young winner Jacob deGrom, and one was against Zack Wheeler who has been excellent in the second half with a 1.68 ERA, the fourth lowest mark in baseball. The final game they lost in their last 20 was against Robbie Ray who hasn’t been fantastic this year, but always kills the Dodgers with a 2.59 ERA over 86 innings against them. The team has performed when it mattered most, considering they’ve faced a handful of tough pitchers. 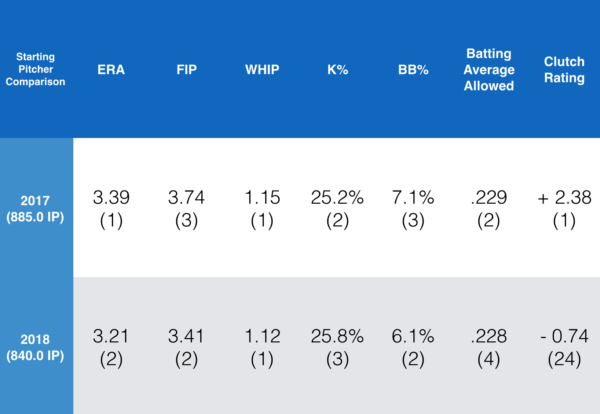 When comparing between the two years, the performance of the starting rotation is nearly identical to the top-tier performance of last year. In 2017, Dodgers starters won 72 games led by Clayton Kershaw with 18 and Wood with 15, while Rich Hill and Kenta Maeda each logged 12. This year has been much different with a very similarly successful starting staff. Dodgers starters have logged only 51 wins with Hill leading the way at nine wins, while Kershaw, Ross Stripling, and Wood all have eight. This makes the Dodgers one of only four teams without a 10-game winner, joining the Marlins, Royals, and the Padres. Those teams have a combined winning percentage of .374. This is due to a few things, one being that the Dodgers currently have no qualified starters, and it’s difficult to receive wins if your starters pitch significantly less than other teams. Kershaw is the only pitcher on the team who has a chance at being qualified at the end of the season (162 IP+), and that’s assuming he pitches at least 11 2/3 innings in his final two starts. Besides Kershaw, only Buehler and Wood have surpassed 120 innings, and Wood is now in the bullpen. For example, the Astros, Rockies, and Indians all have four qualified starters. Additionally, FanGraphs has a Clutch stat which identifies how much better or worse a player or team does in high leverage situations than they would have done in a context neutral environment. The starting rotation last year led the league at +2.38, well above the league-average of +0.63. This year the starters have performed much worse, sitting well below the league-average mark of +0.10. Lastly, the most relevant factor is that even with great performance from starters, poor bullpen performance will ruin potential wins, which ultimately has been the culprit more often than not. When adjusting for all the NL offensive statistics to be without plate appearances by pitchers, it creates a more accurate comparison between NL and AL teams. With that said, the Dodgers have produced at a very similar level as last year, but feature higher rankings in nearly every measure of offensive performance. That is due to the home run per fly-ball rate being down from 13.8 percent in 2017 to 12.8 percent this year and in turn, the league-average OPS is down from .762 to .739. With the team performing as well as they did last year while league wide offense is down, their production this year is even more impressive. This is demonstrated in the jump in wRC+, which accounts for the overall offensive performance with the league-average production set at 100. 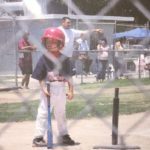 This means that the Dodgers have generated a league-leading 16 percent more runs than an average team would have in the same situations. Obviously, one major factor which hasn’t been addressed, is the incredibly awful Clutch performance. Last year the Dodgers weren’t fantastic, but they were better than the league-average of -1.54. This year, they’re dead last in the league and impressively below the league-average mark of -1.14. To put this into context, the clutch statistic goes back to 1974, which means it accounts for 45 years in total. Among all Dodger seasons since 1974, the offensive clutch rating this year is the second-worst performance of all 45 of those Dodger teams. The only worse team were the 1989 Dodgers at -7.64, as they went 77-83, good for fourth in the NL West. FanGraphs’ PythagenPat and BaseRuns projections both expect the team to be 93-60 at this point, a difference of eight wins from their current record. Baseball Prospectus has multiple record projections, but all of them have the Dodgers with the largest gap between actual and projected performance, expecting anywhere from 93-97 wins at this point. The most games the Dodgers can possibly win this year is 94, at the very least 10 wins behind the last year. If both the starting pitching and the overall offense is performing as well if not better than the squad that won 104 last year, there’s only a few things that can explain the team drastically under-performing this year. One is the bullpen, and the other is offensive performance with runners on. We’ll analyze those over the next couple days.